When we saw a press release the other day from a company called iCall claiming that its app would allow free calls from your iPhone using either its 3G or WiFi connection, we had to check it out. If iCall worked as it claimed, you would be able to avoid using your monthly minutes for most domestic calls—unfortunately, it didn't. iCall is one of many VoIP (Voice over Internet Protocol) providers—Skype and Vonage are probably the two best known. Previously, all VoIP calls over the iPhone could only use a WiFi connection. This was a limitation put in place by Apple/AT&T to prevent overloading the 3G data network (and, likely, to keep cell phone bills up). 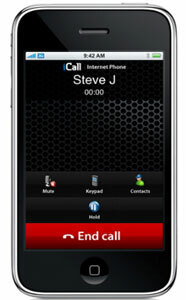 So iCall's announcement that you could now use its app over 3G - allowing you to get VoIP almost anywhere - was very interesting. To get the iCall service for "free" requires you to listen to ads when placing calls. This is not so onerous, considering that you're getting free calls. And, in our experience, we didn't actually get any ads. So no complaints here. A more full-featured, ad-free version will run you $9.95 per month. We tested the iCall service over both 3G and WiFi and found call quality and reliability to be lacking, to say the least. Half the time, the calls simply would not connect. When we were fortunate (or unfortunate) enough to get a connection, there were significant voice delays and constant choppiness. And every call was dropped after about 30 seconds. If these issues only occurred when using 3G, we could chalk it up to limitations of AT&T's network. But iCall was just as bad using our WiFi connection, where AT&T is completely out of the picture. The result is a free app that's not worth the price. I am testing it for business applications as I have a lot of out of country clients. Its actually not as bad as you make it out to be. It may be you had the free vs paid version. I’m not sure. My calls are seamless and pretty much the same when I use my cell or voip. I have an unlimited plan so its not to avoid extra minutes but when I call out of the country, I pay more as unlimited is confined to the US. It makes a lot of sense if one makes calls out of the country. Thanks for posting your experiences. iCall is a great concept and, in fairness to iCall, we haven’t retested it since this review. It’s possible that their systems were overloaded from so many people trying to connect after the original press release, resulting in the far less than stellar performance. I have the paid version on my iPod Touch and canceled my plan early due to lack of support. I used it exclusively in the Wi-Fi mode and tested it in every receiving mode I could think of. I used to be a QA engineer in the VOIP industry. The outgoing calls were good in voice quality and connection. The incoming calls however were random in their connections. For instance if I COULD get the call to connect, then terminated the call and tried to reproduce the success, it would fail to connect using the same set of procedures. I opened 3 problem reports and none were every responded to. They took down their chat/support pages and have not released a new product since Nov 2008, according to their web site. The only support they will gie you is a FAQ page that looks like a marketing type created. They seem to be content with catching a few people like me, for $10 a month as a business plan. That is sad, I really need a VOIP application that works without have to get my friends to sign up for Skype or something else.